According to Temple University journalism professor Linn Washington, news about Africa in Black publications continues to be far and in between. In fact much of their African coverage, like mainstream media coverage, is from news services like AP and Reuters. But all is not lost. During the recent National Newspaper’s (NNPA) Mid-Winter conference and highlighting global expansion of the Black press, Dr. Arikana Chihombori-Quao, African Union Ambassador to the United States, spoke of the importance of a global expansion of the Black Press, particularly to Africa and the Caribbean. Concerning the history of African coverage, former Muhammad Speaks editor Askia Muhammad, who was the last Muhammad Speaks editor, said Black publications historically lagged behind in their coverage of Africa. In fact, for a time, Muhammad Speaks, which was published by the Hon. 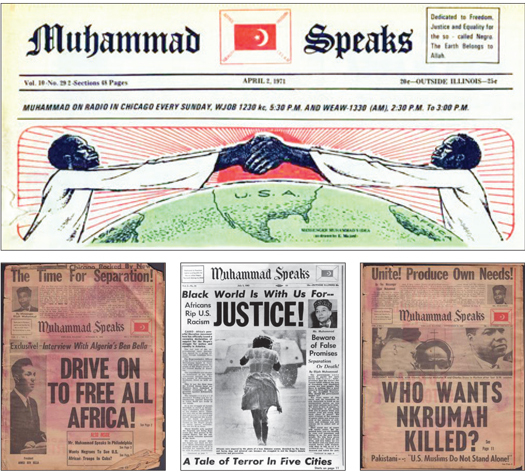 Elijah Muhammad and the Nation of Islam, was the only national weekly that covered Africa. Backed by the paper’s publisher, Nation of Islam leader Elijah Muhammad, Woodford recounted Mr. Muhammad’s inspiring words to him when he was first hired. “All we want you to do is tell the truth and bring freedom, justice and equality to the Black man and woman of America. The devil has built his empire on lies, and we can destroy it with the truth,” Mr. Muhammad said, according to Woodford. At the Black newspaper publishers gathering, AU ambassador Chihombori-Quao said the Black Press should not only seek to become outlets for African news stories, but publish original content, local stories written in Africa by local journalists. “African leaders are saying with one voice, one mind, and one heart that we are one continent,”Ambassador Chihombori-Quao was quoted as saying. Her words can only be realized if that voice is being transmitted to Africa’s 1.2 billion inhabitants and Africans in the Diaspora. Currently Africa suffers from a brain drain, African professionals going abroad to work. A proposed continent-wide free trade area would possibly be the world’s largest. Black media could be essential—not only to get the word out—but to convince, through open and frank discussions with the African Diaspora the benefits of Africa becoming the world’s largest free trade area. It’s not in the best interest of the Western corporate-owned press to champion Africa. Their history has been to paint Africa as “a dark continent” where wars, corruption and famine is the norm, without ever revealing their hands at the root of Africa’s ills. An example of an African news organization sharing content has been AllAfrica.com’s pioneering approach of publishing articles from over 130 African media outlets. Muhammad Speaks became a global phenomenon because it was able every week to show firsthand links between the world’s liberation struggles. It became so popular, with over one million readers weekly, that world leaders like Ghana’s president, Kwame Nkrumah and Nigerian president, Knamdi Asikiwe, became frequent contributors to Muhammad Speaks.